After a bit of a breather that focused on silver-haired burglars and crazy scientists with disappearing apes, the “Alien Costume Saga” begins its acceleration towards the finish line in Amazing Spider-Man #256. We get another new villain named after an animal flashcard (Puma), a more prolonged look at Peter Parker’s love life with appearances from Black Cat and Mary Jane, and some more hints of there being something rather cryptic and sinister about the black costume (*don’t forget to read the Secret Wars limited series!). It’s funny in that when reading and writing about these comics individually, on first blush it would appear that Tom DeFalco is decompressing the story a bit. That’s normally a huge bugaboo for me as a reader as I noted in a recent write-up on Brian Michal Bendis and Ultimate Spider-Man. However, upon further reflection, I think the “Alien Costume Saga’s” narrative reflects a pseudo-mystery novel that DeFalco is trying to pace out incrementally. In past interviews, DeFalco has discussed his love and knowledge of the mystery genre (which was a big reason why he vetoed the Kingsley brother idea that Roger Stern pitched for the “Original Hobgoblin Saga” – because he thought it was an unfair reveal to the reader). Throughout this issue, DeFalco gives the reader just enough to whet their whistle, but fails to deliver a true, full-blown reveal to shock the audience. This trend obviously ends with the events of ASM #257 (but you’re going to have to wait until next week for that!). So in looking specifically at some of the little appetizers DeFalco and artist Ron Frenz put out there in this issue, we get a little more information about the Spider-verse’s newest crime boss in the Rose. The character is still as enigmatic as he was in his very first appearance in ASM #253 (what’s with the purple mask, and of course, the obsession with roses? ), but we also found out that he reports to Wilson Fisk, aka, the Kingpin of crime, which is an important little tidbit. This quick, but significant reveal makes more sense in light of the fact that Rose is eventually unmasked as Kingpin’s son, Richard Fisk, though as DeFalco and Frenz have said over the years, they originally intended for Roderick Kingsley to be the Rose (and Fisk would be the Hobgoblin). The Puma gets a nice introduction in this issue as an adversary that could become a major headache for Spidey, but as I alluded to earlier, DeFalco and Frenz really only give us a taste. 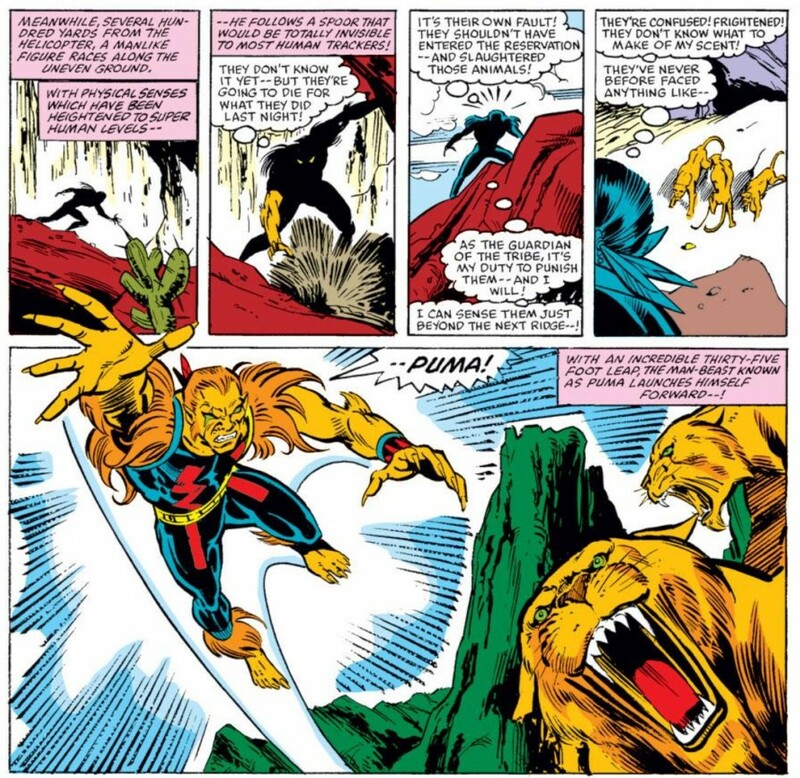 The villain’s alter ego, Thomas Firehart, is established as a wealthy Native American with underworld connections (and is capable of responding to vague, monosyllabic instructions from the Rose), but we don’t get a full sense of the character’s powerset outside of the fact that he can physically transform his body into that of a humanoid puma. It’s safe to assume there’s some enhanced speed, strength and agility that comes with such a transformation, but this is definitely an instance where a little more is needed for a first appearance. Even the actual fight between Spider-Man and Puma is oddly paced and imagined. 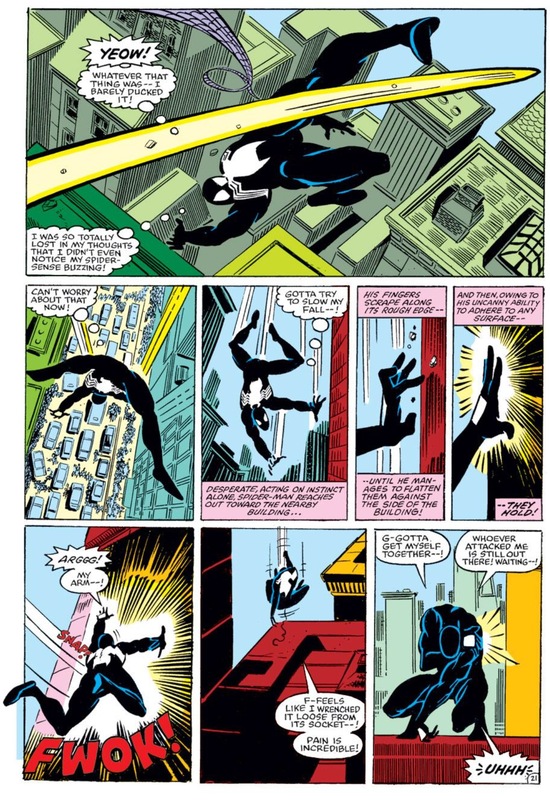 The Puma launches a huge chimney pipe towards Spidey, who narrowly avoids it thanks to being lost in thought (and perhaps extraordinarily fatigued, which is ultimately the bigger mystery unraveling in this arc – why is Peter so tired and lethargic all of a sudden?). Spider-Man separates his shoulder while trying to catch himself from falling, leaving himself wide open to the Puma’s advances. 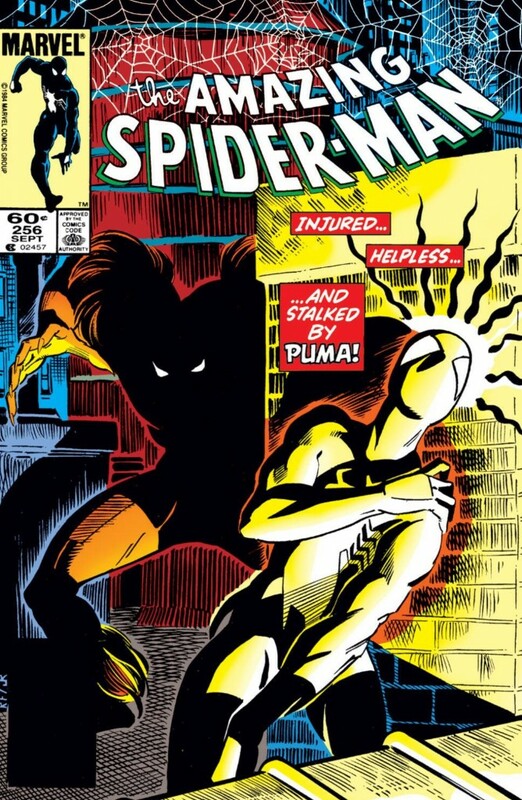 This works well in terms of it being a heck of a way to build suspense for the next issue (the final image is Puma standing over Spider-Man), but it’s unclear whether or not Spider-Man injured himself so badly because of something extraordinary the Puma did to him, or because of his own clumsiness/inattentiveness. Trust me, this is not a huge concern of mine for a 30-year-old story, but just something I noticed when reading this comic again for the purposes of this feature. Something that I really did fantastic about the Spider-Man/Puma confrontation is the fact that Firehart hesitates before striking his fallen foe. Puma wonders if it would be dishonorable to kill Spider-Man off (and complete his task as assigned to him by the Rose) when he’s unable to defend himself. By adding this layer of complexity to Puma, DeFalco and Frenz demonstrate that he’s not just another hackneyed, mustache-twirling villain looking to kill the hero and take over the world. Firehart would later go on to be a bit of a “tweener” in the Marvel Universe, which obviously stems back to his characterization in his very first appearance. It’s a curious bit of nostalgia for a storyline that simultaneously feels like a throwback and a new direction forward for the Spider-Man universe. 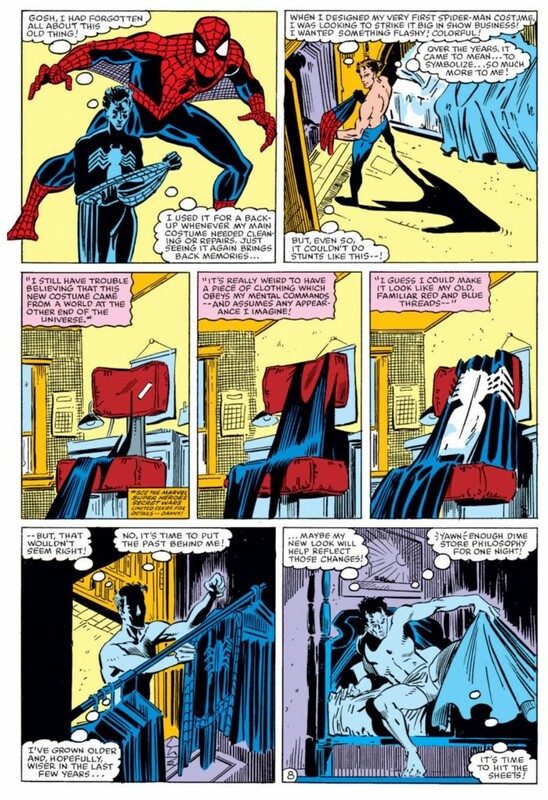 Why Spider-Man would feel even the least bit conflicted about his attire, which even goes as far as to peel back around his lips so he can make out with the Black Cat, seems a bit off, though it would all tie-in to some of the ominous foreshadowing DeFalco and Frenz weave into ASM #256’s narrative. Frenz’s artwork throughout these last two issues really emphasize the sinister qualities of the black costume, more so than what Rick Leonardi accomplished in ASM #253-254. We don’t typically get classic horror movie references in Spider-Man comics (appearances by Morbius and Man-Wolf aside), but there’s definitely a creature from the black lagoon or whatever quality to how Frenz illustrates the costume slithering towards Peter as he sleeps, stalking him and preying on him when he least suspects. The whole aesthetic makes the final reveal that the costume is symbiotically using Peter as a host, all the more logical and shocking at the same time. This is part five of the “Alien Costume Saga.” Check in next week for part six.